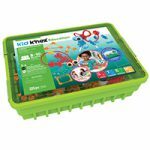 Expertly curated by Mackin’s team of education professionals, these leveled kits are an essential part of every school’s makerspace initiative. Students will learn about renewable energy, recycling, electricity, physics, geometry and much more as they explore the world around them. 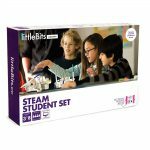 These engaging, high-quality kits are the perfect way to support STEM/STEAM initiatives and the Next Generation Science Standards. Every MackinMaker kit comes with a password to enter the “Get to Know Your Kit” Portal on Mackin.com You will have unlimited access to kit-specific Challenge Cards and an awesome Maker Journal for your students. Presents a board that you can paint on with water to create designs that then disappear as the water evaporates. Teaches students and teachers how to let things go and live in the moment. Contains twenty different colors of Play-Doh for children to use to express their creativity. 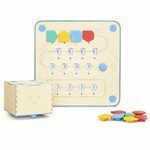 Provides a collection of blocks in order to help students learn the basics of coding while building and acting out programs. Provides the parts and instructions for creating eight models for young students. 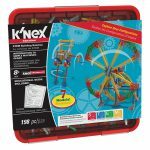 Provides KEVA planks and an idea booklet to create ramps, chutes, crazy contraptions, and funnels to help students learn about balance, geometry, proportion, and composition. 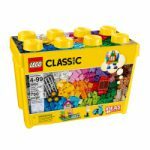 Contains over 700 LEGO®s for students to create different projects. Includes thirty-three colors, windows, doors, and other special pieces to help inspire creativity. Provides tools to use while creating new and inventive things with recycled cardboard. 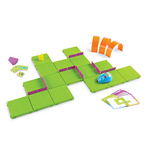 Introduces coding to young children through a kit that allows them to build a maze for Colby the robot mouse to find his way through. Provides a way to make paper airplanes fly for thirty seconds at a time while introducing children to aerodynamics, aeronautics, and physics to children. 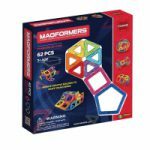 Provides five Cubelet robots and one Bluetooth hat that can be put together to make a large robot or used separately. This kit includes brick adapters which allows the user to attach Cubelets to toys in order to make the toys come to life. Introduces coding to young students through a wooden robot, storytelling, and hands-on play. Explores computer programming without a screen or digital interface. Instruction cards suggest different projects to be made using KEVA planks that help students learn about balance, composition, and geometry. 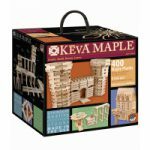 Provides the parts and instructions for creating 3D towers, magic balls, rockets, and castles. 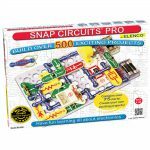 Provides the equipment and instructions needed to create electrical projects using play dough. 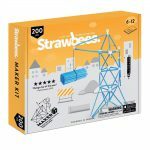 Provides the parts and instructions for creating sixteen maker projects including animals, a bridge, and a crane. Provides the parts and instructions for creating twenty-three unique models. 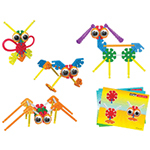 Also offers preschool students the flexibility of creating their own unique creations. Provides instructions for building two robots that help students learn about coding using their own creativity. Includes STEAM activities and instructions for a downloadable app with more games, lessons, and challenges. 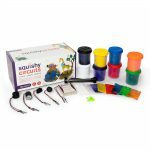 Provides eight containers of dough to be used with Squishy Circuits kits. 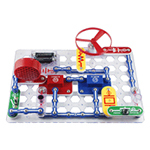 Provides the equipment and instructions needed to create electrical projects using play dough. 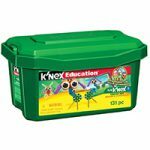 This kit supports up to thirty students working in groups of three. 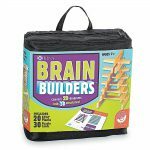 Provides the parts needed for a classroom to build and create large things out of straws. Provides the parts needed to build and test three motorized vehicles including a bulldozer, a dragster, and a dune buggy. 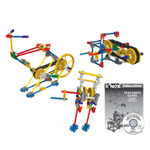 Explores the gears, traction, vehicle design, and torque for children ages eight and older. Offers ideas on how to add personal LEGO bricks to customize the vehicles. 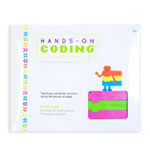 Provides flash cards to use with the Dash robot to help students learn about the fundamentals of coding. Contains a robot to help children six and up learn about coding. 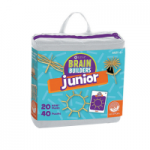 Includes Dash Robot, Launcher, Xylophone, and Sketch Kit. 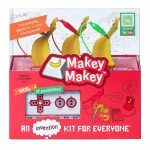 Provides the equipment and instructions needed to create over 100 projects for students eight and up including a flying saucer, an alarm, and a spin draw. 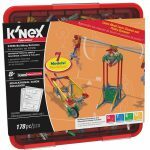 Provides the parts and instructions for creating seven replicas of real-world simple machines. Offers instructions on how to make everyday objects into touchpads and computer mice. Allows students to learn through augmented reality by using their sense of touch to hold the Cube to interact with virtual objects such as the solar system, geometric shapes, and objects of their own creation. Teaches students STEM principles through the use of touch and augmented reality. Provides a robot and instructions on how to control the robot’s lights, sounds, and movements in order to teaching coding skills to students eight and up. 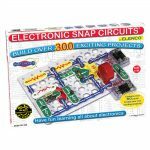 Provides the equipment and instructions needed to create over 300 projects that teach students basic electricity, how transistors function, how oscillators work, how capacitors function, and how photo sensors work. Provides the parts and instructions for creating seventy different models including a hot air balloon, a shark, and a plane. 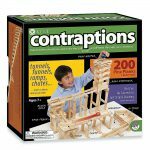 Instruction cards suggest different projects to be made using KEVA planks that help students learn about balance, proportion, composition, and geometry. Provides tools for creating new and inventive things with recycled cardboard. 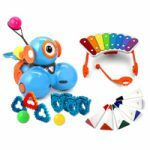 Provides a robot and instructions on how to control the robot’s lights, sounds, and movements for teaching coding skills to students eight and up. Contains a robot to help children six and up learn about coding. A multipurpose sawtooth blade box cutter featuring double edge and non-stick coating. 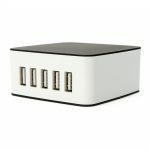 The 5-port USB Wall Charger will charge Cubelets as well as an iOS device, cell phone, tablet, PC or other device with a 5V USB power input. 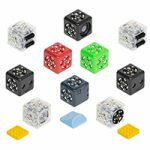 Provides ten Cubelet robots and one Bluetooth hat that can be put together to make a large robot or used separately. This kit includes brick adapters which allows the user to attach Cubelets to toys in order to make the toys come to life. 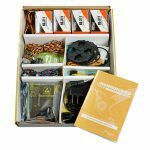 Provides the equipment and instructions needed to create over 500 projects that teach students about electricity. Provides the parts and instructions for creating eight replicas of real-world simple machines. Provides the parts and instructions to build your own tablet. Teaches students how to code through making art, music, and games. Provides a collection of parts along with guides to help students and teachers learn how to code by creating different games. Offers instructions on how to create electric circuits through interactive artwork using circuit stickers from Chibi. 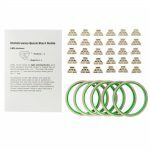 Provides a collection of ten alligator clips to make electrical connections without soldering. 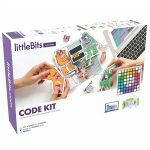 Provides the parts and instructions for creating around a hundred unique items including prehistoric creatures, the Eiffel Tower, and a helicopter. Provides one roll of copper tape to be used in electrical projects. Provides everything needed to get started with programming on a micro:bit board including four ideas to try before moving on to your own ideas. 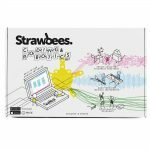 The Coding and Robotics Kit includes Strawbees, servos, light sensors, LEDs and the Quirkbot itself. 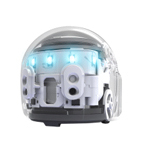 Offers instructions on how activate and use SAM blocks to create new inventions that can be wirelessly activated using a Bluetooth connection in order to make sound, move, or light up. Presents a collection of ninety LED circuit stickers. 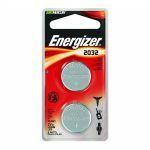 The Energizer 2032 is used in heart-rate monitors, keyless entry, glucose monitors, toys and games. Holds power for 8 years in storage. Provides a collection of parts along with guides to help students and teachers face eight invention challenges while teaching problem solving, critical thinking, and collaboration. Provides a robot that helps students to learn computer programming through hands-on activities. Contains a robot to help children eleven and up learn about coding. Includes four different avatars to engage children in interactive communication, inventing, and tinkering. 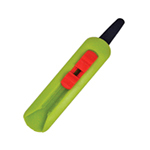 Provides a tool with a retractable three inch blade to use while opening boxes or making shallow cuts. 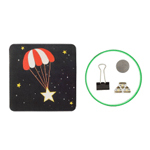 Provides the materials needed to create a shining star card using circuit stickers. 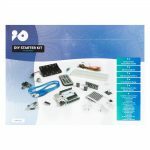 DIY basic starter kit for Arduino contains over 80 items including resistors, buzzers, LED, and a UNO Development Board. Offers instructions on how to use the Raspberry Pi 3 Model B+ to measure light levels, accept switch inputs, and power lights using the GPIO pins. Provides instructions on how to create and program robots, kinetic sculptures, and animatronics for students ages thirteen and up. Provides instructions on how to build a robot car that can then be controlled using either Bloxter or Python. Includes access to free projects on the Internet along with many free, built-in lessons on how to program the GoPiGo. Provides a collection of parts along with guides to help students and teachers create sixteen products while teaching problem solving, critical thinking, and collaboration. Offers a collection of sensors to help students learn about acceleration, motion, humidity, temperature, and sound. Provides tools for creating new and inventive things. 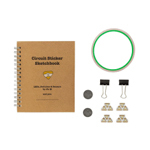 Ready to download your MackinMaker Challenge Cards and Journal included in your purchased 2018-2019 MackinMaker Leveled Kit? Access all the digital resources with your password from the “Get To Know Your Kit” letter included with your purchase. Follow this link to get started. Build a collection as individual as the students you serve.